I’ve been finding recently that learning new things about health and nutrition can be kind of addictive – addictive to the point of borderline obsession sometimes. Once you start learning about the differences between modern, processed foods and a traditional real food diet, it can be easy to go a little bit crazy with reading and researching and making changes to the way you eat. 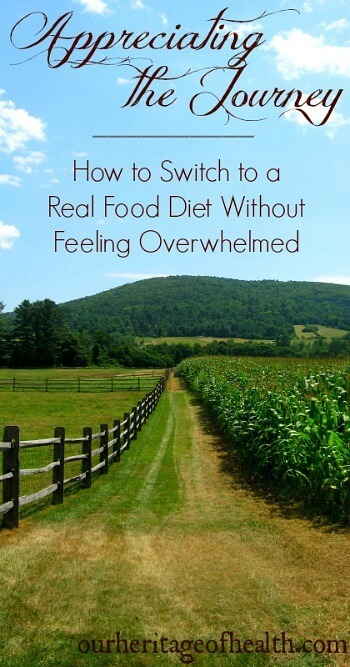 Sometimes the transition to a real food diet and a healthier lifestyle can seem a bit overwhelming. I’ve made quite a few changes to my diet and lifestyle over the past few months, but it still feels like there are so many changes I want to make. 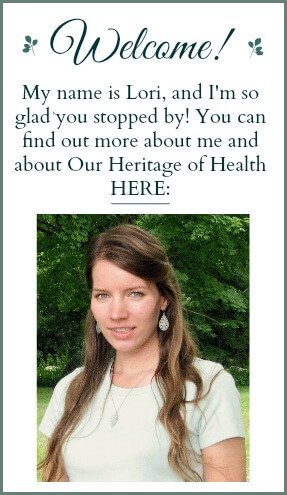 There are so many things that I still haven’t tried yet and many aspects of natural health that I’d like to learn more about. I’m trying to remind myself, though, that I don’t have to do them all this week, or this month, and maybe not even all this year. The transition to healthy, traditional foods doesn’t have to happen all at once. It can happen step by step by focusing on making just one small change at a time. As much as it may be important to learn about health and nutrition and to try to prepare healthy meals, I’ve been realizing that it’s equally important not to stress over food and food preparation. Healthy food should be a priority, but finding balance should be even more of a priority, in my opinion. There have definitely been times that I’ve let myself get too obsessed about food. There have been nights that I’ve stayed up much later than I should have researching about food on the internet, and many times I’ve made extra trips to get organic ingredients I couldn’t find at the regular grocery store even though it meant I was making my schedule even more busy than it already was. I really do enjoy reading about health and nutrition, but all of that reading will probably do me more harm than good if I end up staying awake past midnight scanning articles and blog posts rather than getting the full night of sleep I know I should be getting. And as important as I think it is to have organic food, having conventionally-grown produce for one week might just be better than the stress caused by trying to squeeze an extra trip to the health food store into a day already packed with other activities. Sometimes I find myself focusing so much on the changes I haven’t made yet and the things I haven’t had time to try that I forget how far I’ve actually come from the unhealthy diet and lifestyle that I used to have. Up until just a couple of years ago, most of the food I ate came out of a box or a bag, and, except for the occasional batch of homemade cookies, I hardly ever cooked or baked anything myself. When I was younger, I was the poster-child for junk food. Fruit-roll-ups, Kit Kat bars, Poptarts, Cheese Doodles, I ate them all (and not much of anything else). My idea of a “healthy” after-school snack was to put several large spoonfuls of reduced-fat peanut butter spread (it was only 60% peanuts and 40% who-knows-what-else) and mix in a huge handful of M&Ms or chocolate chips. I even used to eat fake store-bought frosting straight out of the can by the spoonful. Pretty disgusting, huh! My diet in college wasn’t much better either. I basically survived on cereal, crackers, and raman noodles. My serving of “fruit” for the day was one of those packages of sugary fruit snacks that I thought were a healthy option because they were “made with real fruit juice” (yeah, like 1% maybe!). And I don’t even want to think about how many preservatives and artificial flavors and how many gallons of high fructose corn syrup I’ve probably eaten over the years. Now, though, my diet looks completely different. I cook almost all of my food myself at home from scratch using natural, organic ingredients. I go to farmer’s markets and farm stands to get fresh produce in season, and buy pasture-raised eggs from local farms. I bake my own bread with homemade sourdough yeast and keep a little garden to grow some of my own vegetables and herbs. I never would have even thought of doing any of those things a few years ago, but now they all seem perfectly normal to me. 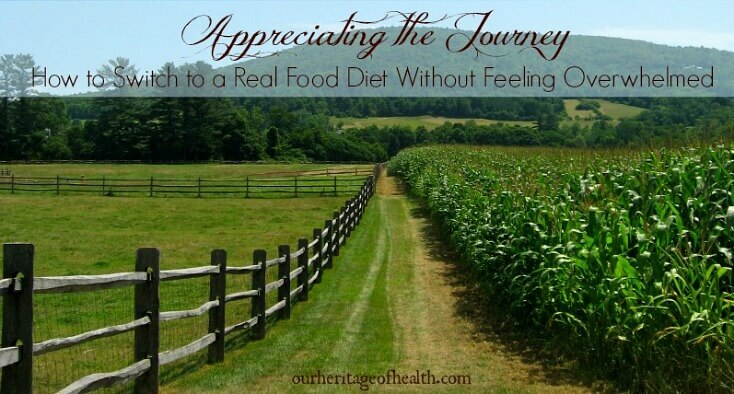 My transition to whole, real, natural foods has been a very gradual one. I’ve learned new things about food little by little and have made one small change to my diet at a time. Over time, though, all of those little changes in the foods I eat have made a huge difference in my overall diet. And my journey towards a real food diet hasn’t just changed the things I eat. It’s changed the way I think about food, too. When I was eating processed junk foods, I was so removed from the original source of my food, and I never saw any of the steps that my food went through to go from the ground to my plate. Now that I’ve started cooking and even growing some of my own food, I understand so much more about where my food comes from and what it takes to create a healthy, nourishing homemade meal. Making the switch to a real food diet can be a pretty dramatic change sometimes, but it’s a change that doesn’t have to be done overnight. The transition can be a series of small changes that eventually turn into a significant shift in lifestyle. This post is linked to Make a Move Monday at Simply Made Home, Scratch Cookin’ Tuesday at Granny’s Vital Vittles, and Frugal Days, Sustainable Ways Wednesday at Frugally Sustainable. As always you say it so beautifully Lori. Thanks for sharing. Your post is a great encouragement.